Unilever Food Solutions’ new, easy-to-use Food Labelling Ingredients and Legislation Guide provides the answers to many questions that frequently come up in the food and food service industries about nutritional values, labelling and legislation issues. The new guide, which will be released globally following its successful launch in South Africa last year, demystifies food labels – from nutritional content and additives to allergen information and food safety – while also helping manufacturers and chefs to easily adapt their menus to specific nutritional needs and dietary requests. Available for download at no cost from the Unilever Food Solutions (UFS) website (www.ufs.com), the guide is accessible to all. “At last nutrition labelling, food safety and special dietary requests are made simple and practical in this new easy-to-use tool,” says UFS nutrition expert Keegan Eichstadt. UFS South Africa has distributed over 150 copies of the hard-cover guide to chefs, operators and schools around the country for their use – and it is being hailed as a valuable book that is providing a wealth of the right type of information. Says SA Chefs’ Association (SACA) president Stephen Billingham: “A practical and very relevant publication, The Unilever Food Solutions’ Labelling, ingredients and legislation guide is an invaluable tool for chefs and hospitality professionals wishing to successfully comply with the Consumer Protection Act and food labelling regulations. He adds that chefs are facing increasing demands from guests to be transparent about their ingredients. Global research conducted with 3,500 diners in the UFS 2011 ‘World Menu Report: What’s in Your Food?’ survey showed that 90% wanted more transparency in their food when they eat out. In food manufacturing too, the book has proved a more than useful tool. Helen Digby of Sally Williams Fine Foods finds the book very enjoyable to read, engaging and interesting. “It takes the most important points from the relevant regulations and simplified them and makes them very easy to understand. 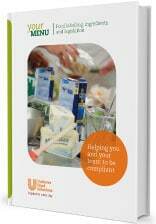 It also provides good and practical advice and guidelines on food safety, ingredients and labelling. Mellis concludes, “The guide is not just a way of complying with the various acts governing food safety. It gives chefs the ability to market their operation as one that has the capabilities and knowledge to provide food for any nutritional requirement, which, at this early stage of legislation, is a unique selling proposition for any restaurant. The guide is available in digital format for free download at www.ufs.com, registration required.